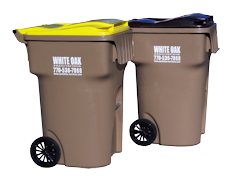 White Oak Sanitation, Inc. is a locally owned and operated company specializing in residential sanitation and recycling services. Our customer service department is open Monday through Friday from 8:00 a.m. to 4:00 p.m.
We want to thank all of you for passing on our good name to your neighbor and friends. Please continue to earn free service with us. All you have to do is recommend us to someone who then calls in and starts service, and we offer you one month of FREE service for every new customer you refer that signs up with us. How easy is that! !